Have you considered the value of encouraging your child to learn, even when school is not in session? Incorporating Montessori methods into your child’s summer activities is a great way to encourage a growing love for learning. And there’s no better time than summer to bring your children outdoors, where the Montessori approach to exploring the world is fun and easy to facilitate. These suggestions can help you make that a reality for your child this summer. Your child’s capacity to gain new skills and grow intellectually, emotionally and physically does not stop when school is out for the summer. And there is evidence that when you foster a child’s education during school breaks, the child is more likely to remember the skills and knowledge they gained during the school year. It’s easy — and sometimes tempting — to allow a child to remain indoors, playing video games or watching television. But the world is filled with so much more magic than that, especially when a child’s imagination and natural curiosity are at play. By encouraging your child to play and explore the outdoors, you are helping them to appreciate the natural world and healthy living, as well as encouraging the act of learning by doing. Invite your child to be a part of preparing meals. This allows the child to develop a sense of self-care and gain practical life skills, a staple of Montessori education. For example, you can invite your child to test how different lids go with different containers. Or they can help stack plastic dishes or wipe plastic cups dry after washing. The kitchen also gives a child many chances to explore food in practical ways, such as how fruits and vegetables look, sound and taste different. Colors, textures and shapes can all be rehearsed as your child and you prepare a meal together. If you have a garden or flower bed, invite your child to sit with you and watch as you tend it. Point out different plants and identify herbs, flowers and weeds. 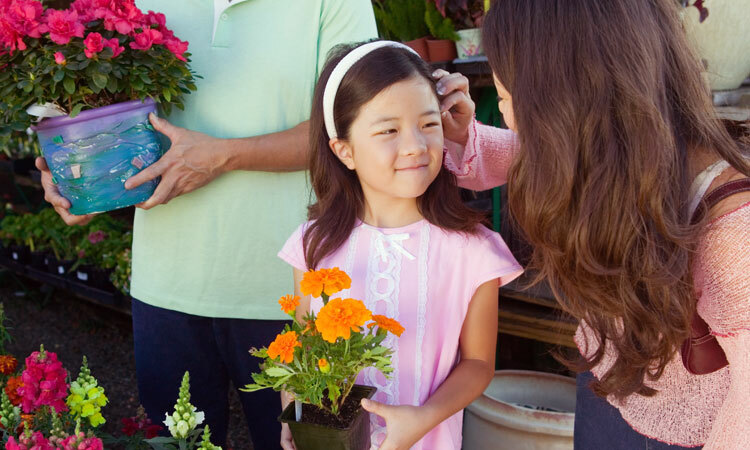 Help your child see firsthand the importance of sunlight by bringing them outside in the early morning hours when flowers open as the sun hits them. Invite your child to water plants with you, and let them feel the damp soil to learn what dry, watered, and overly watered soil feels like. You might even give your child a small shovel, bucket and watering can so he or she can practice tending his or her own plant. A day of exploration at the park is an ideal learning opportunity from a Montessori perspective. Countless experiments with the world can take place as you encourage your child to notice things such as how hot metal can become when in the sun, while clothing does not become quite as hot. Or allow your child to carry a basket so he or she can gather items like flowers, leaves, stones and other natural objects to investigate. Science activities like seeing what floats and what sinks in a tub of water is a lot of fun for children too. Even though school is not in session, it’s important to help your child continue to foster skills in interacting positively with others. So, encourage play dates and cooperative games on the playground. Team sports such as soccer and baseball can be fun, especially when you focus on the value of working together and collaborating. A team scavenger hunt is also a fun way to invite cooperation. Summer camps offer so many opportunities for your child to learn. Cooperative games, physical exercise, exploration of nature and more are all featured at summer camps, including our own Summer Camp Programs. To learn more about our Summer Camp Programs or to schedule a tour of our school, please call our office at 301-309-9532 or use our online form. We’d be delighted to answer your questions and show you firsthand how Primary Montessori can benefit your child.